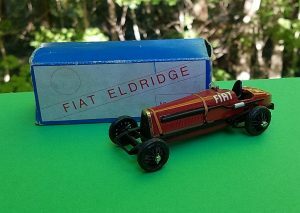 After editing and publishing the Dugu series here at MAR Online, I wanted to search out their 1/43 Fiat SB4 “ELDRIDGE”. 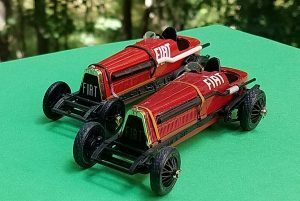 I had had the Brumm version for many years and thought a comparison would be fun. So after two years of searching, I have the Dugu in hand now. Their short history on the bottom of the box (in 4 languages!) 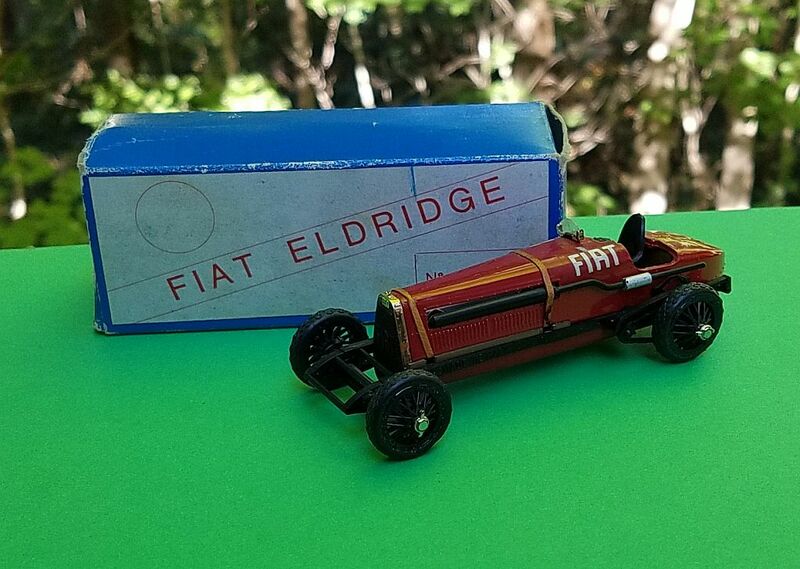 stated that “English Sir Ernest A.D. Eldrige” put a Fiat A 12 bis aero engine from World War I into a 1908 Fiat chassis. 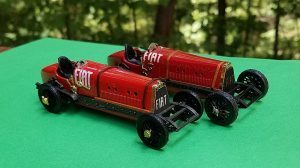 It was nicknamed Mefistofele and set a record at Arpajon, France, of 234 km/hr in 1924. Of course the Italian spelling of Mefistofele uses ‘f’s; it is a Fiat after all! The Dugu is not marked Dugu on the model or the box at all. It was produced from their molds after the factory went out of business by the Milanese model car store, Zeppelin. They did spell Eldridge correctly though! With the two models side-by-side, it is easy to distinguish them: the Brumm has a brighter white Fiat on the radiator and a larger white section of the exhaust pipe. Otherwise, they look very, very similar and have the same dimensions. Both use metal bodies and other parts in plastic. 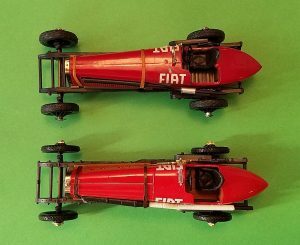 It’s hard to favor one over the other but the Dugu was limited to 1000 pieces and numbered on the box and chassis. Both have separate engine hood straps – the Brumm is plastic, but the Dugu seems to be real leather! There are a few good websites with the history of the car and the owner. Eldridge was a fascinating character. Some good photo galleries are also online: ultimatecar and favcars. The car was at Goodwood 2001 and 2011, so I think some of those photos are from there; it’s currently in the Centro Storico Fiat in Turin. In addition to wiki, the English journal Motor Sport has their historical issues digitized, where they discuss Mephistopheles: 1961, 1925. and again 1925. Fascinating reading!